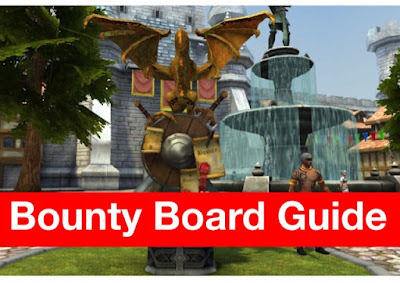 Guide explaining the Bounty Board: what it is, what it can give you, and how to do the bounties. The Bounty Board is a place where adventurers can get daily on-level quests for gold, XP, platinum shop elixirs, and rare unique rewards! 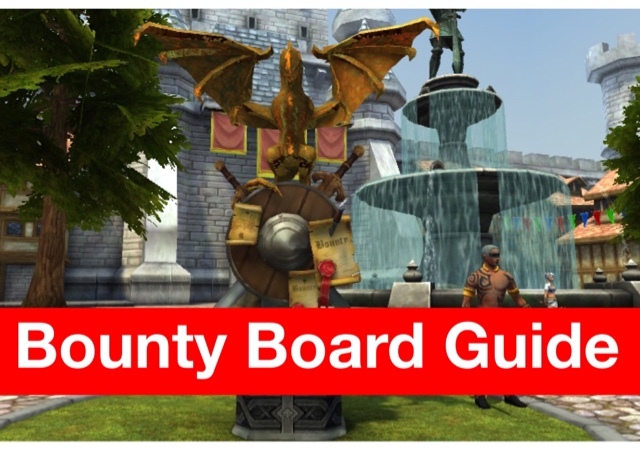 The Bounty Board is in the Castle Courtyard, right in front of the leystone. The quests that you receive will be based off of your character's level. What are the Types of Bounties? Normal Bounties - Normally 1 and 2 star mob quests. Gives XP, gold, and sometimes a Hunters Favour. Elite Bounties - Normally 3 and 4 star mob quests. Gives XP, gold, and sometimes a Hunters Favour/Boon/Prize. Seasonal Bounties - Rare bounties that depend on the current event. Gives XP, gold, and sometimes a Hunters Favour/Boon/Prize. Elite Bounties are labeled Elite, and Seasonal Bounties are labeled with the name of the current event. How Many Can You Do Per Day? You can do up to a maximum of 6 bounties per day by using Bounty Pledges. They can be turned in to unlock more bounties. Buying them from the platinum shop. Bounty Pledges are consumed when you use them at the Bounty Board, and cannot be reused. So one bounty pledge = one additional bounty. This quest requires you to gather up the remains of hunters and loot relics from them. They are located in all zones, and can be picked up off of the ground. Please see the video below for the Hunter's Pledge Quest Guide. There are over 500 different bounties available through the bounty board, based on your character's level. The links below are videos of only a few of them.